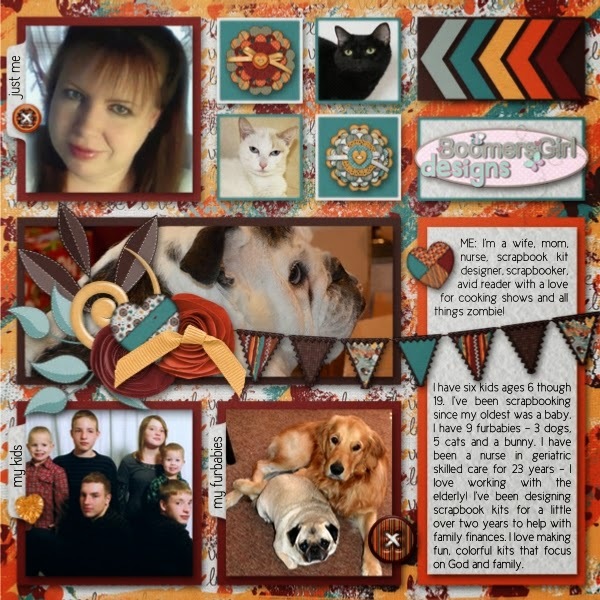 MyMemories Blog: Today's Daily Designer....Boomersgirl Designs! I am the happily married mom of 6 gorgeous children - 5 boys and 1 girl - ranging in age from 6 years old to 19 years old! We also have 9 adorable furbabies - 5 cats (all adopted from the local humane society), a Lionhead bunny and 3 dogs (an English Bulldog, a Pug and a Golden Retriever). I have been a nurse in geriatric skilled care for 23 years - I love working with the elderly. I began designing digital scrapbook products about two years ago in an effort to help supplement our income. We take pride in supporting our own family. In my spare time, I enjoy scrapbooking (of course), reading (mostly dystopian and post-apocalyptic books) and writing! I am also a fan of cooking shows (especially MasterChef Jr.) and zombie shows! Visit Boomersgirl Designs at these Social Sites! Enjoy 30% off Boomersgirl Designs at MyMemories today ONLY!